Good news to all SMART and SUN post paid and pre-paid subscribers because the power of these both networks can now be in your hands. 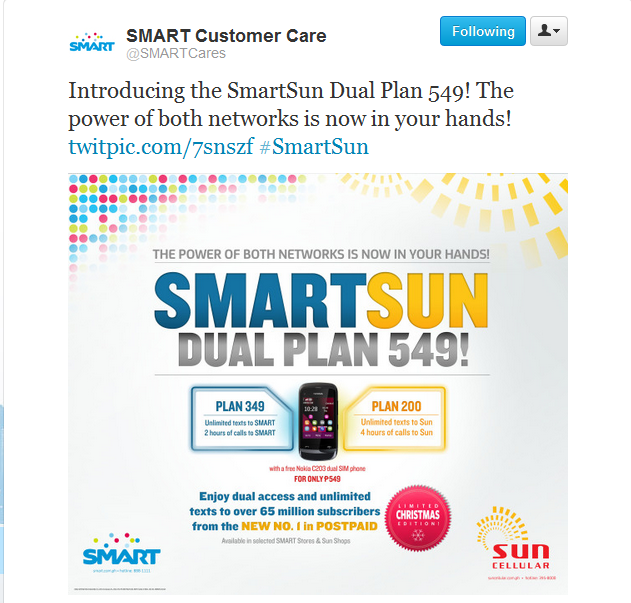 SMART tweeted and even post on their official Facebook page their latest limited Christmas edition subscription plan – SMARTSUN Dual Plan 549 – giving you the power to connect between these two network carriers. 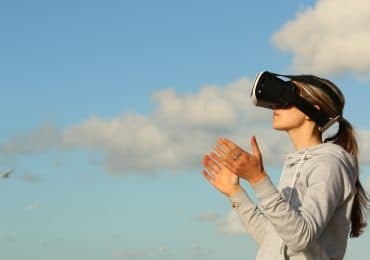 For those who are still confused and wondering why and how did these two competitive network carriers merged together just to give you these promo. Well it’s quite simple, it’s because SMART which is owned by PLDT already acquired Digitel Telecommunications Philippines which happens to be the owner of SUN Cellular. And now, they came up with this limited Christmas edition promo plan for all their end-subscribers for only PhP 549.00. And what’s more likely about this promo is they’re giving out FREE Nokia C2-03 handsets along with this subscription – of course it should be a dual-SIM powered handset since I believed that you’ll be using two SIM packages simultaneously under this subscription plan. Unfortunately, neither of the two carriers disclosed the details and mechanics of this promo called SMARTSUN Dual Plan 549 and I am still waiting for SMART Care Center to provide me more details about this promo. 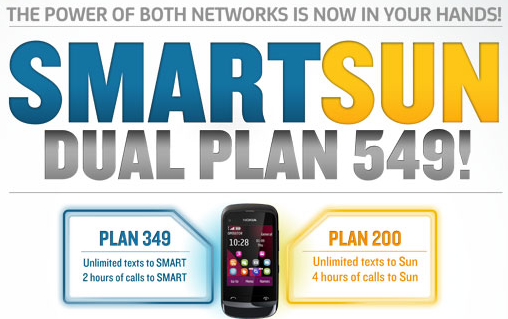 However, by judging the poster SMART posted on Twitter and Facebook it looks like that SMART will be combining two post-paid subscription plans which are SMART’s PLAN 349 (Unlimited SMS/texts and 2 hours of voice calls to SMART network) and SUN Cellular’s PLAN 200 (Unlimited SMS/texts and 4 hours of voice calls to SUN network). Not bad. It’s economical and practical – a real money-saver deal. About the Nokia C2-03, this Nokia handset is one of the latest mobile released this year (around September 2011) and not actually bad if you asked me. It’s a 103mm x 51.4mm x 17mm touchscreen device weighing 115grams with handwriting recognition. It also have a 2MP 1600 x1200 pixels camera at the back and a QCIF @15fps video camera. Unfortunately, since this is low-budget mobile phone there are some features that you might be looking for that won’t be on this phone and of them is you won’t be able to use this phone for accessing the Internet that is if your connection preference is through WiFi because this handset is not WLAN or WiFi enabled. I guess you have to settle with the GPRS/EDGE connection if you want to update your Facebook, Twitter or surf the Internet. You can visit Nokia’s official website for the full specifications of this handset – Nokia C2-03.